I’m one of those people that if there is even one brown speckle on my banana then I’m not going to eat it. I prefer my bananas a little green, I guess it’s one of my flaws. So, as you can imagine, I’ve had a lot of bananas go uneaten over the years. And for a very long time now I have been hunting for that perfect banana bread recipe. You guys, I have made dozens of banana bread recipes. I am not kidding. So I finally created what I consider the perfect banana bread. I’m going to walk you through what makes this banana bread so perfect. First up, let’s talk bananas. To make this banana bread just right, you need EXTRA ripe bananas. Not just a few brown speckles, like almost black (see the picture). Why do you want them this dark? Well, the longer that bananas ripen the sweeter they taste and the stronger the banana flavor. One common flaw I saw with my recipe testing was that if the bananas weren’t ripe enough then the banana flavor of the bread wasn’t strong enough. So I also experimented with adding more banana to strengthen the flavor. The problem with this was that too much banana tended to make the bread too dense and a little gummy. So, I did two things to solve this problem—one, use extra ripe bananas and two, butter. So be patient and wait for those bananas to ripen completely! 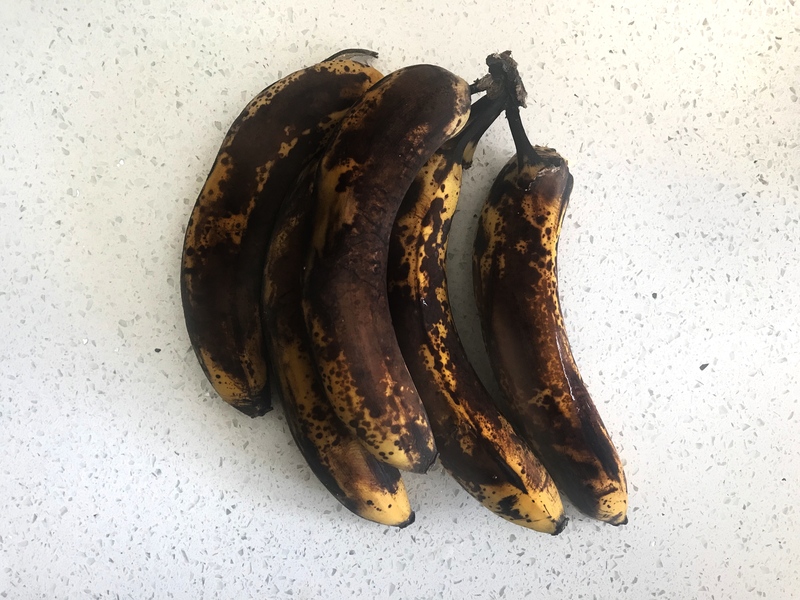 Tip: Place your bananas in a plastic bag and close the bag, this will trap the natural gases released by the bananas and speed up the ripening process! Butter—I know oil is a very popular choice for banana bread but butter is going to be the best this recipe. First off, butter just tastes better. That was a given, but also, using softened butter (NOT melted) is going to keep your banana bread from being overly dense. Now I know that banana bread is supposed to be a dense bread, but trust me too dense and you’re gonna be sad. When you cream together your butter, sugar, and eggs you are whipping air into the mixture which is going lift the texture of the bread and give it a more delicate crumb. Sugar—I chose to use brown sugar over white sugar because that touch of molasses in the brown sugar gave the bread an extra rich flavor that the white sugar lacked. You will, however, sprinkle some white sugar on top of your batter before you bake it. The sugar will caramelize on top and create a delicious and beautiful crust! Preheat oven to 350 degrees Fahrenheit. Cream together butter, eggs, brown sugar, and vanilla for 3-4 minutes until light and fluffy. Color should lighten and volume should grow slightly. Mix in mashed banana until there are little to no chunks. In a bowl mix together flour, salt, and baking soda. Slowly add in to batter, mix until flour is just incorporated. Do not over mix. Pour batter into a well-greased loaf pan. If adding sliced banana on top, slice banana into ¼” slices at an angle so you get oval shaped pieces. Shingle bananas down both sides of batter. Generously sprinkle 1 tablespoon of sugar over the top of banana and batter. Bake 55-75 minutes until center comes out clean when poked with tooth pick. Cool completely before slicing and eating or the texture will turn out gummy. The banana slices on top are decorative and are optional.